Imagine a day where you get to drink green teas all afternoon, chat with some of your favorite people, and munch on perfectly paired sweets. I won't deny it, being a tea blogger has its advantages. It's always an adventure when tea people get together, and our last tasting is no exception. 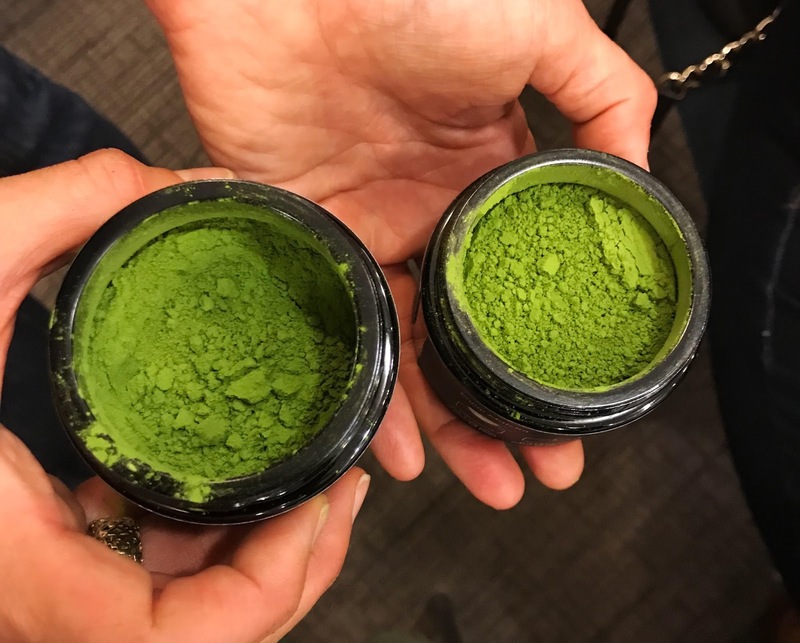 I had the privilege of joining some of my favorite tea friends for an extremely memorable afternoon, and thought it would be fun to share it with all of you. 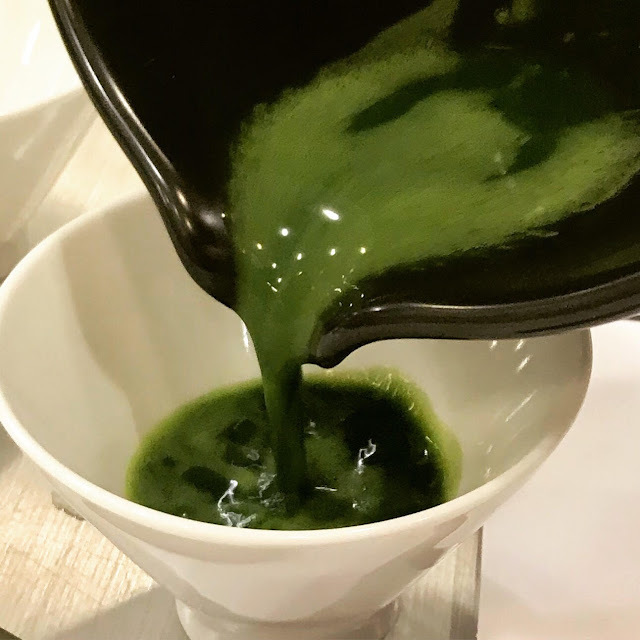 To begin the day we started with a tasting of the new Matcha Gyokuro selection at La Colombe, expertly prepared by Alexis of Teaspoons and Petals, the resident tea consultant. She brewed the tea to perfection using a Silverton pour-over brewer, which was also fun to watch. I arrived late to our first tasting, so sadly I didn't get any good images. Needless to say, after a few sips of this well-balanced tea and exchanging hugs with some friends, I was ready for the adventure yet to come. We made our way to the International Culinary Center (ICC) and up to library, the perfect venue for our Rishi Tea tasting. The ICC library is a special place. The walls are made of glass and lined with shelves upon shelves of culinary books. I think this is what the library looks like in foodie heaven! We were greeted by the always elegant Keiko from Rishi Tea, and were sat at a long table decorated with flowers and adorned with plates of decadent French macarons and mochi. Like I said earlier, being a tea blogger has its advantages. Keiko chose the sweets well. The macaron flavors paired perfectly with each green tea, highlighting savory and vegetal notes. We had the chance to try Rishi green teas of various cultivars, something I've never done before. 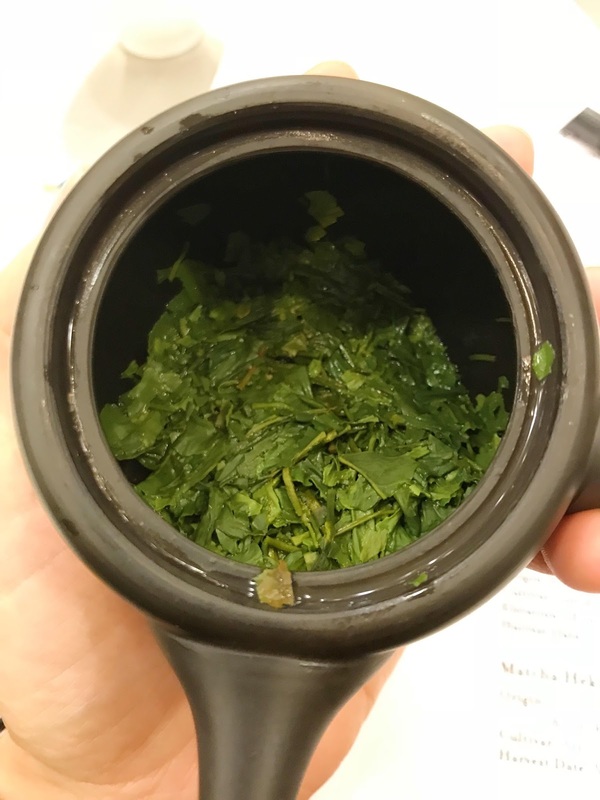 I don't know as much about Japanese green teas as I should (except that they are delicious), and I was grateful to learn and taste so many high-quality teas. This was a unique opportunity. The teas were broken down into 'flights', small groups of tastings where we could compare and contrast (many of you have had either tea, beer, or wine flights before, I'm sure). I won't go too deep into specifics so be sure to check out Nicole's post for a look at the entire tea flight menu, as well as more photos from the day. I was focused on the experience and not as much on notes and photography. 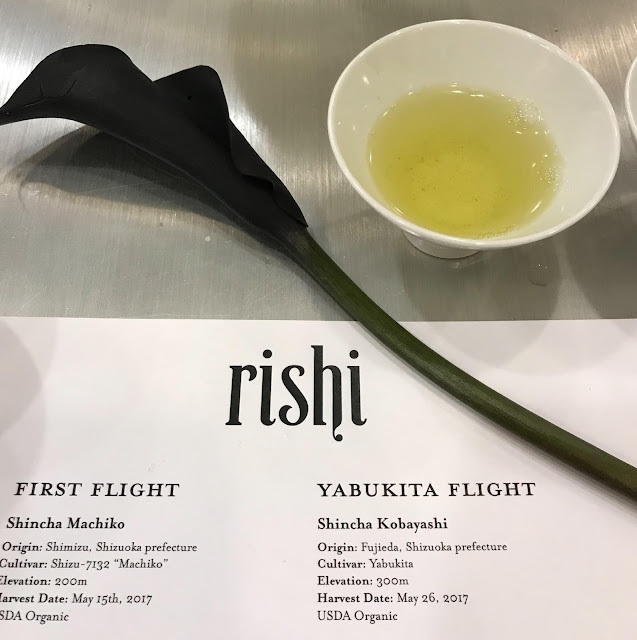 The first flight had Sincha Machiko and Matcha Okumidori. The Shizu (aka machiko) cultivar is known for its cherry blossom floral flavor, and the tea certainly kept its promise. It was like tasting a fresh blossom. The okumidori cultivar made a chocolatey thick matcha, which reminded me of a roasted tea. After these two teas, I was eager for more. A great way to start. The second flight was dedicated to teas of the Sae Midori cultivar. We had a hand-picked shincha which surprised me with its delicate flavor. It wasn't grassy or the slightest bit bitter. We then had an extremely savory and light gyokuro, and a matcha that was a touch more bitter than the first, but still chocolatey with an interesting buckwheat note. I usually stick with fairly cool water for teas such as these, but I was surprised to learn that Keiko slightly warmer water for the gyokuro, at 170°. It's a good reminder to keep an open mind about water temperature- experimenting a little bit can help enhance the flavor of the tea, or at least change the flavor to something your palate prefers. We then moved to the Yabukita flight, a cultivar that is more common than the others. But these teas were anything but standard. 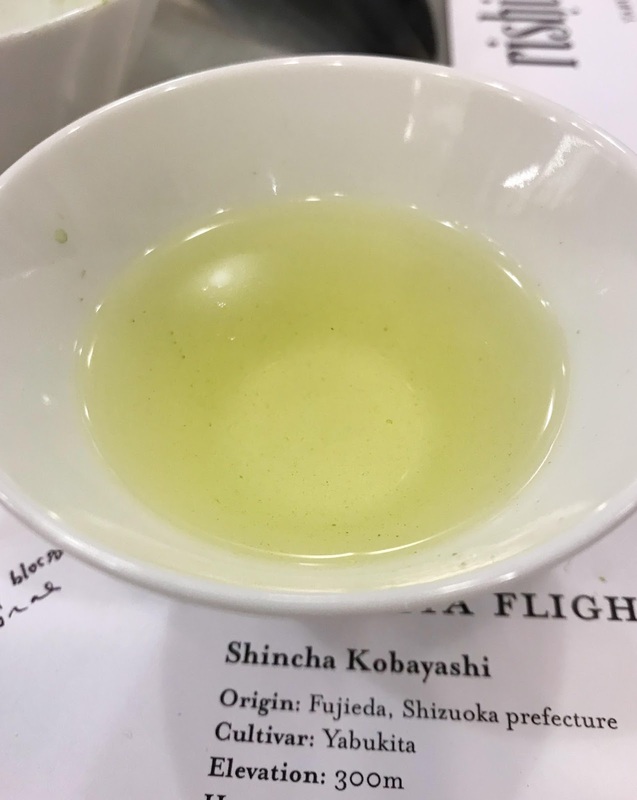 This flight started with a super sweet shincha without a hint of bitterness. We then moved to an even sweeter 'Nishi family Shincha' that was a bit deeper, with a little hint of bitterness. Oh and in case you were wondering, all the sips were interspersed with mochi and macaron goodness. Tough day, right? Unfortunately I had to leave the festivities early because responsibilities were calling. I didn't have a chance to try a few of the teas, but Keiko made sure I tasted one more before I left. I finished the afternoon on a perfectly sweet note. 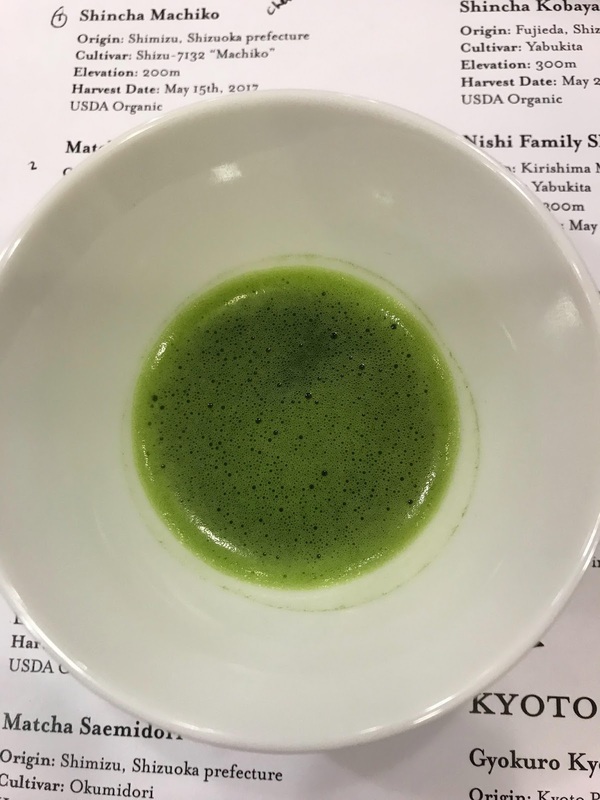 Keiko whipped up Matcha Hekisui for me, and it tasted like vibrant sweet peas. It was my favorite of the various matchas we had. It wasn't easy to leave such a cheerful room of fabulous women, but obligations were calling. Needless to say I was flying high on tea happiness by the end of our tasting, feeling grateful to have so many amazing women in my life. Thank you to La Colombe, Rishi, Keiko, and the ICC for such a dreamy afternoon. Being a tea blogger is, to quote Larry David, pretty, pretty, pretty... pretty good.